T. Rex were a British rock band fronted by guitarist, singer and songwriter Marc Bolan. Formed as Tyrannosaurus Rex in 1960s London, the folk rock group's debut album My People Were Fair and Had Sky in Their Hair... But Now They're Content to Wear Stars on Their Brows (1968) reached number 15 in the UK. In the 1970s, they achieved mainstream success as a glam rock band with the hits "Jeepster", "Get It On", "Ride a White Swan", "20th Century Boy", "Children of the Revolution", "Hot Love", "Telegram Sam" and "Metal Guru". 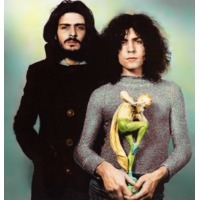 After waning commercial success in the mid-70s, T. Rex ended in 1977 after Bolan was killed in a car accident.